Order within the next... 4 hours, 56 minutes, 34 seconds ...for dispatch today! Beautifully made by Italian craftsmen. Artisanal twist on a classic design. Presented on a beautiful 17 inch Briarwood board. 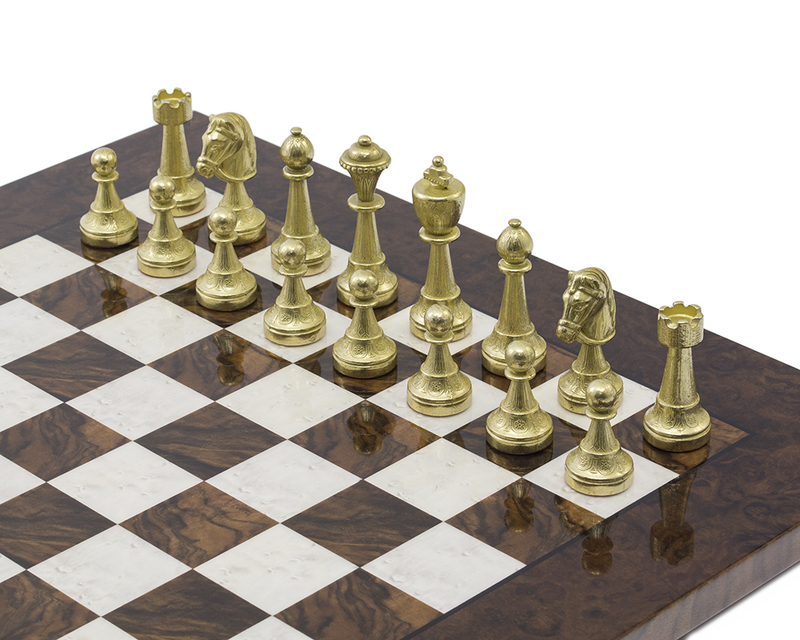 Uniquely artisanal, The Finnesburg Series Chessmen are delicately shaped by Italian craftsmen and are a beautiful version of the traditional Staunton chess pieces. 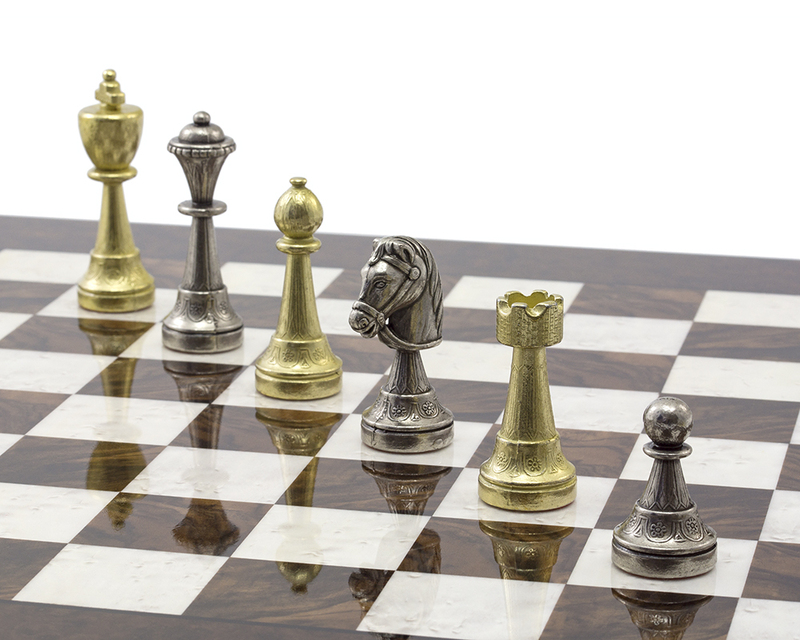 These solid brass and nickel-plated chessmen are ideal for decorative or practical use. 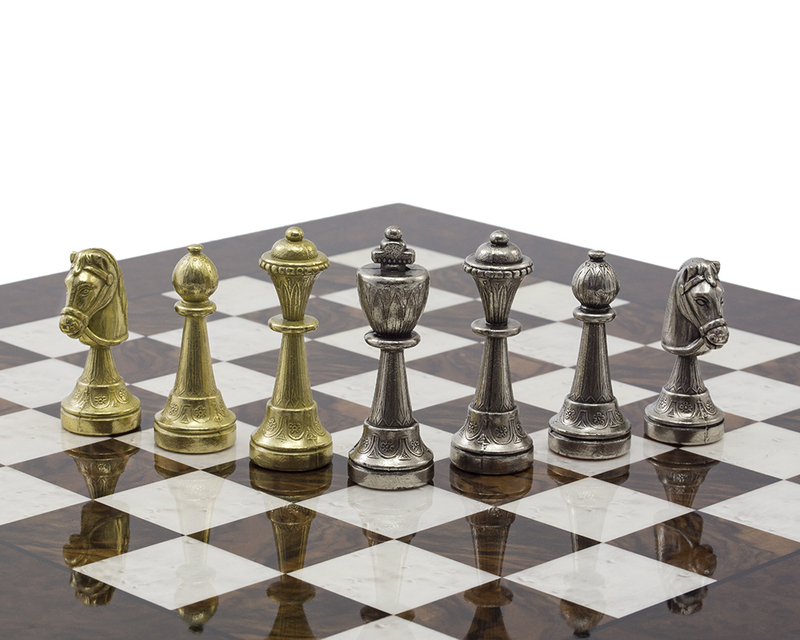 Demonstrating the uncompromising quality of these pieces, it is the pawns, perhaps, offer the best example of the attention to detail honored within this set, boasting as they do painstaking touches of craftsmanship. It this commitment to a sometimes overlooked, yet undeniably important piece that defines the uncompromising quality of the Finnesburg Series Chessmen. Every other piece on the board enjoys the same level of attention and we have matched them with a beautiful briarwood board to highlight the close detail and expert finish on these pieces. 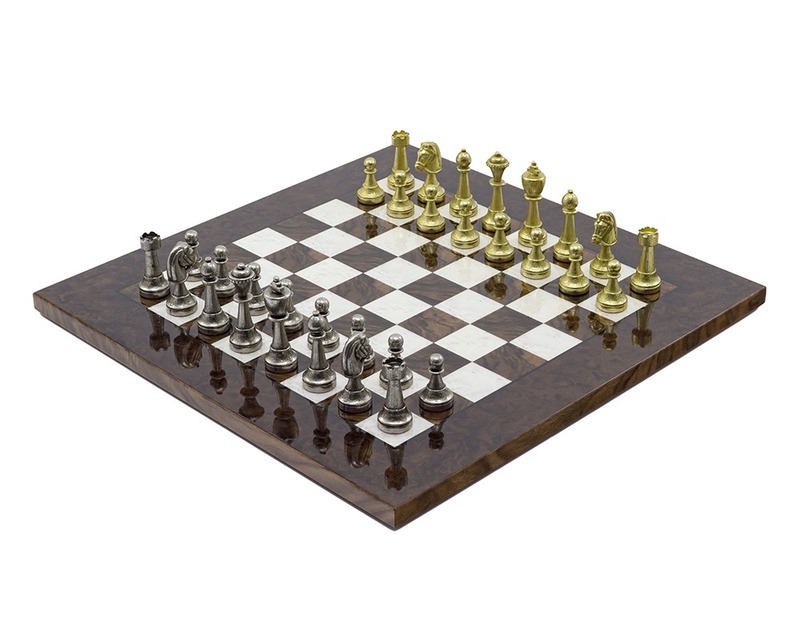 This outstanding quality Italian board is made from briarwood and elm veneers with a quality gloss lacquered finish. The wood grain and ‘knotting' of the briarwood give a rich depth of tone and patterning. The inlaid veneer squares are bordered with a thin veneer of ebony that sections off the playing area from the edge. The underside of the board features a lacquered wooden veneer and has felting pads to protect surfaces underneath. 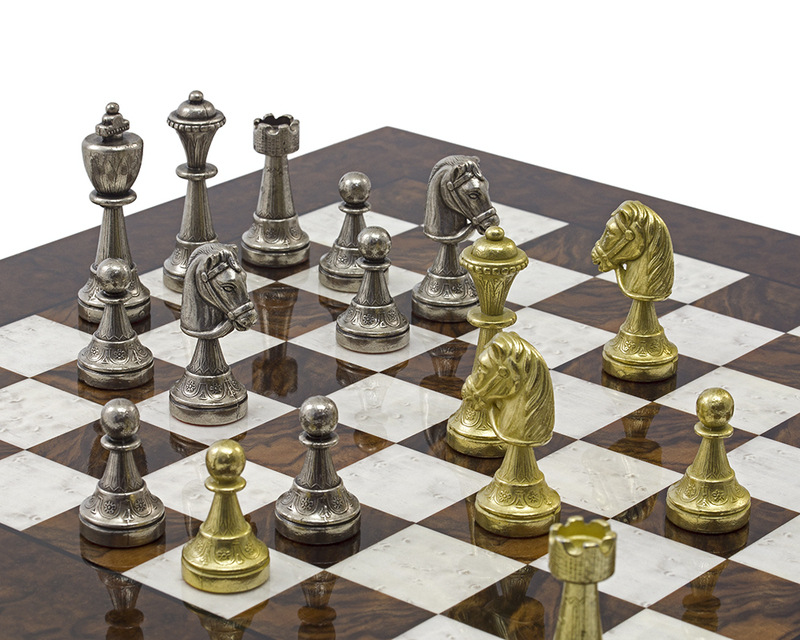 All in all, a stunning and enviable chess set. "I haven't seen it yet, but my daughter thinks it is perfect. i Mummy The chess set is perfect!!! We have already played a game and I won!! Everything is so nice about it. 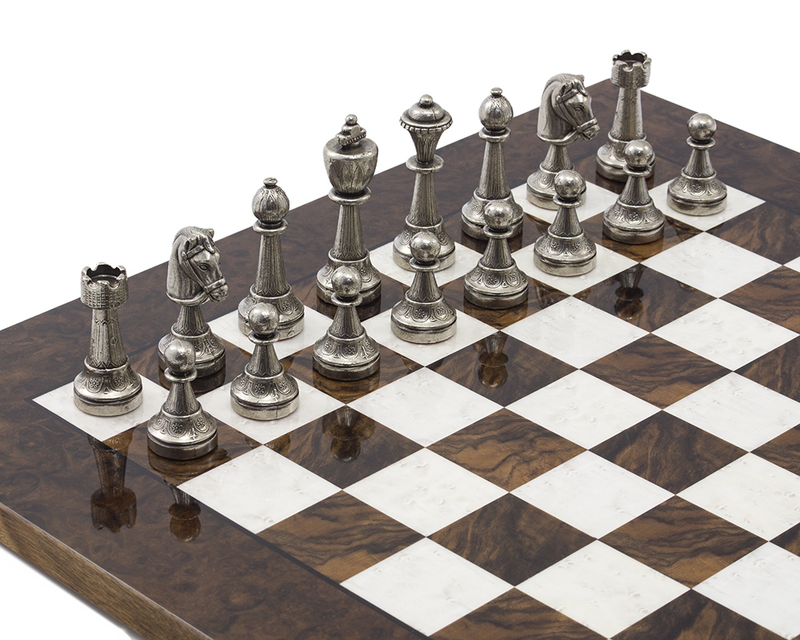 The weight of the pieces, the shinyness of the board and the beautiful engraving on the pieces. I can't wait to play with you when you get here! Love"